More than 30 years after they first worked together,11 members of the cast of Dark Shadows reunited on stage in Brooklyn, New York, on August 31, to perform a dramatic reading of the new play Return to Collinwood. It was written by Jamison Selby (pictured, left), son of DS star David Selby. 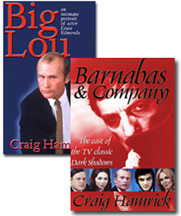 The two-hour play was a crowd-pleaser, resolving mysteries established in the series and updating the lives of popular characters -- including some not featured in the current story (such as Barnabas, Julia, and Joe). The Festival audience laughed, cheered, cried -- and at the end gave an enthusiastic standing ovation. The next day, the cast reassembled in a Manhattan recording studio to record the play for release on CD. The CD is now available. Click here to visit the MPI site to pruchase it. After growing up in a haunted house, Carolyn Stoddard has become a renowned expert on the paranormal and the occult. She is head of the Dept. of Parapsychology at the University of Maine, but her mother's recent illness (and death) caused her to take a sabbatical at Collinwood. She is married to attorney Ned Stuart. 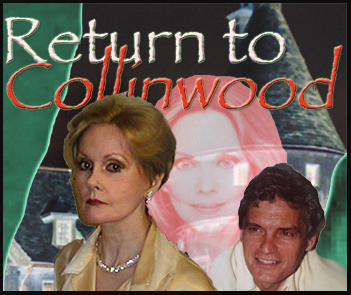 After years of wandering the world, Quentin Collins has settled at Collinwood. He recently tried to track down David Collins, but lost his trail in the middle of a South American jungle. (After a falling out with his father, David left Collinwood and became an archeologist.) With Roger Collins dead, Quentin has taken over the family business. Angelique has returned from the netherworld and wishes to claim her rightful place at Collinwood. She is masquerading again as Cassandra Collins, Roger's second wife, but her disguise does not fool those who have known her before, including Quentin and Willie. Maggie Evans married her longtime boyfriend, Joe Haskell, but he was killed in a boating accident ten years ago. She is now the head of administration at the Windcliff Institute for Mental Health and is romantically involved with Quentin Collins. Ned Stuart has been the attorney for the Collins family for many years. When Carolyn returned to Collinwood to care for her mother, she and Ned fell in love. They have been married for about a year. Sebastian Shaw is an inmate at Windcliff and has been in a catatonic stage for many years -- making him an ideal pawn for Angelique. 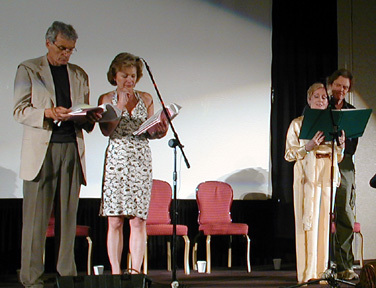 Other characters are mentioned in the play: Barnabas Collins and Julia Hoffman are taking a spiritual retreat in Hong Kong. Roger Collins died two years ago. And Elizabeth Collins Stoddard has just died, after a long illness. It's 2003, and Quentin Collins has stopped roaming the earth and settled at Collinwood. Carolyn Stoddard and her husband, attorney Ned Stuart, are living there as well, and a spooky housekeeper named Mrs. Franklin looks after them. Quentin has found love with Maggie Evans, who is now the head of the Windcliff Institute for Mental Health. Ironically, one of the patients there is Sebastian Shaw, who once brought an emotionally disturbed Maggie to the sanitarium. Now, she is trying, with no success, to break through into Sebastian's catatonic world. Elizabeth Collins Stoddard's recent death has left her daughter, Carolyn, in a fragile state. Carolyn is revisiting an old hobby -- painting -- in Collinwood's tower room. She's been painting landscapes, but her latest project features a mysterious blonde woman she doesn't recognize. When Quentin sees the painting, he realizes it is Angelique, the witch who has plagued him (and his cousin Barnabas) through the ages. In fact, although she is unaware of it on a conscious level, Carolyn is being visited by Angelique's spirit in the tower. Carolyn holds a seance to try to contact Elizabeth, but instead, she opens a door for Angelique to escape the netherworld. After Carolyn collapses at the seance, Dr. Robert Harper comes to check on his former student and help investigate the strange happenings at Collinwood. At the Old House, while installing a whirlpool bath, Willie and Jessica Loomis discover a letter from Barnabas Collins, along with Quentin's portrait. The reading of Elizabeth's will holds a few surprises. Cassandra Collins, Roger's second wife (actually Angelique in disguise) is an invited guest -- and she inherits a home on the great estate. Willie Loomis and his wife, Jessica, are given the Old House, where they've been living and making improvements. And the biggest shocker: Elizabeth confesses that before Carolyn was born, Elizabeth had a child out of wedlock. Victoria Winters, once employed at Collinwood as governess, is actually Carolyn's big sister. In the late 1960s, Vicki was transported into the past and has not been seen since. In the will, Elizabeth implores Carolyn to find Vicki and bring her home. Angelique awakens Sebastian to do her bidding. She and Quentin clash, but they reach a stalemate. Fed up with Quentin's mysterious behavior, Maggie threatens to break off their relationship. He braces himself and begins to tell Maggie the incredible truth about his supernatural past. The play sets the stage for at least one sequel -- or perhaps even a new series. Check out TV Tidbits.com, Craig Hamrick's new site featuring trivia about classic shows like Dark Shadows, Bewitched, I Love Lucy and more!